What the G20 Should Talk About in Pittsburgh. On August 25th I attended a soiree hosted by the Pittsburgh Opera in the Strip titled The Pittsburgh Summit (G20) Behind the Scenes. Neither this event nor any of the local newspapers I have seen have clearly presented the purpose or the topics actually to be discussed when the G20+ representatives visit the ‘burgh. It seems a strange omission. When people are guests in my home town and causing some inconvenience, I would like to know why they are here and what they hope to accomplish other than to hold a large and expensive global photo op. I have the same question for those protesting the summit. What exactly is your beef, other than that you don’t like global capitalism? Of course establishing this would require reasoned discourse among the parties in lieu of pure spin and emotion. In the absence of this, I am offering the following reflections. "Some in rags, and some in jags and some in velvet gowns." The G20 representatives are coming to town in Pittsburgh this September on the basis of the city’s and Southwestern Pennsylvania’s success in reinventing themselves for the global economy. For from being beggars, the G20 and attendant nations are the wealthiest countries in the world, though that may not be saying much these days. The Post-Gazette and Tribune-Review have been breathlessly detailing plans for security and housing at the conference, along with plots at the Thomas Merton Center to protest the global economy (which seems to me a bit like trying protest gravity). Hopefully by September the Hilton will have resolved it’s current financial troubles and the city’s other hostelries will provide adequate housing to attendees. Otherwise, Angela Merkel and Vladimir Putin might have to bunk with Pitt and CMU students or resort to Warm Showers or Couchsurfing for a place to stay. Over the past one hundred years, Pittsburgh and Southwestern Pennsylvania produced the basic goods that went into transporting, housing and feeding citizens in many of the G20 countries attending the conference in September. Carnegie steel went into building railroads in Russia. Shoppers bought Heinz baked beans from grocery stories in the UK. Pittsburgh plate glass went into automobiles rolling off Ford’s assembly lines for drivers around the world. Though manufacturing still exists in Southwestern Pennsylvania, the region’s economy and identity have shifted in the past thirty years to services such as education, information technology and health care, along with dubious growth industries such as long-term care for the elderly, gambling and finance (though recent events make the last two seem indistinguishable). Last June the Post-Gazette (itself a member of a beleaguered industry ) showed a photo of the Carnegie Homestead Works in the 1980s. Where steel workers labored and fought for their livelihood one hundred years ago, the Waterfront mall sits offering mostly low-wage jobs with minimal or no medical benefits. The mall promoters originally promised that it would help replace jobs lost when the large steel mills closed. No doubt G20 representatives will be gratified when the arrive to see Target, Marshalls and other chain stores selling cheap imported goods from overseas, assuming they stop on their way to or from the airport. The rhetoric of economic redevelopment offers cold comfort to unemployed and unemployed workers in Pittsburgh’s late summer weather. The sons and daughters of steel workers struggle to pay their bills and put their own kids through college on $10-an-hour jobs. Literally on the other side of the tracks the town of Homestead works at the real labor of reinventing itself. Boarded up storefronts dot 8th Avenue, the town’s main street, but investors are turning old industrial warehouses into new lofts for urban pioneers. The Blue Dust restaurant, named for the particles of ore that once hung in the air from the mills, recently opened on Amity Street. The Rivers of Steel Heritage Center celebrates the town’s steelmaking past from its offices in the Bost building. The library and music hall that Andrew Carnegie built in 1898 in tribute or expiation for his treatment of the men whose blood, sweat and labor built his empire still sits on a hill above the town. It offers a lively schedule of concerts and other events for the community. About the distance of a cannon shot which striking workers fired against the Pinkertons in 1892, the old Pumphouse huddles along the Monongahela River as though against the rising tide of chain store commerce. Incidentally, the workers won the battle of Homestead against the Pinkertons, but lost the war. Frick and Carnegie prevented them from unionizing until the 1920s. The story of Pittsburgh’s re-invention for the global economy is more complex than feel-good reporting about LEED buildings, academic-business partnerships and retraining workers for knowledge-work. There are winners and losers. Both the old working and the new creative classes that Richard Florida wrote about before he left Pittsburgh need to pay their bills. They need jobs for that – even uncreative ones down on the cube farm. They need affordable places to live, healthcare and a sustainable economy that will ensure them money for retirement. They need hope that their skills and talent are valued and that employers will continue to have a place for them. 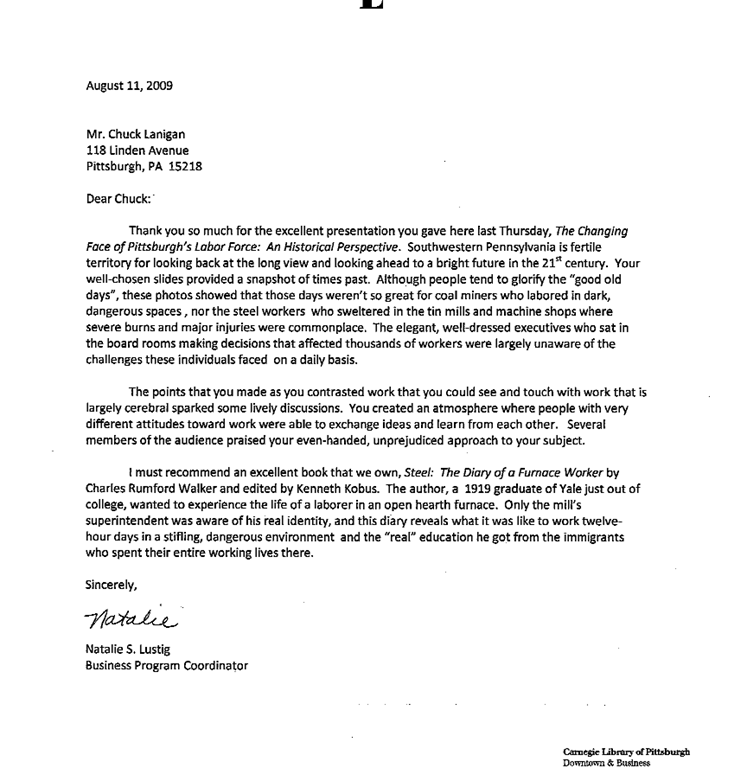 Yet my interviews for a project on labor and identity and the e-mails that come across my laptop reveal an increasing number of workers of all types in Pittsburgh struggling for contract work, responding to bogus job postings on Craig’s list and searching for low cost health care. In this post-Andy Warhol, Youtube world, the unemployed place their resumes and faces on the Internet hoping to be discovered. Perhaps they might do better going on American Idol. How can individuals and communities in Southwestern Pennsylvania maintain their sense of identity and worth when their prospects of finding a lifelong career and doing a meaningful day’s work now seem as anachronistic as a shot and a beer at Chiodos Tavern after a day shift at the mill or seeing the Pirates play (and actually win) a game at Forbes Field. This is a question bigger than this region. It is a global question that the G20 should be addressing. Robert Reich wrote 18 years ago* that in a global economy traditional notions of national identity and measures of work and success become superfluous. As goods, information and employees cross international boundaries, capital is no longer a possession of the state, but of business organizations that owe allegiance only to their shareholders. Then, Reich wrote, a country’s true wealth lies in the skill and knowledge of its citizens. The mission of the G20s representatives should be to seek ways to foster conditions in which individual workers and communities like Homestead (or Hamburg or Manchester) are sustained and prosper. As the past nine months have shown, no nation is immune from the Pandora’s box of financial imps and demons that Harvard MBAs and Chicago-School economists have loosed upon the world. To paraphrase Benjamin Franklin (a global citizen) we must all hang together in searching for answers, or hang separately. And everyone who attended my presentation on stories of labor and identity in Homestead on 8/9. It was warm outside, but the old Pump House (site of the 1892 steelworkers strike) stayed fairly cool inside. We had a great audience and lively discussion. The event collected donations to benefit the Greater Pittsburgh Community Food bank and was held in memory of Joe and Frankie Healy. Joe was a beloved storyteller in Pittsburgh and instrumental in organizing Tellebration. Please see my Links and Reading page at www.sanepractices.com. I will be presenting material from To be of Use: Stories of Labor & Identity in SW PA on August 30th part of the Carnegie Library’s Sunday Poetry and Reading Series.